We moved the chickens out of the pasture and into the barn for the winter, and to make it easier for me post-knee surgery to care for them. They dont have a big area, but they mostly only roost in there. 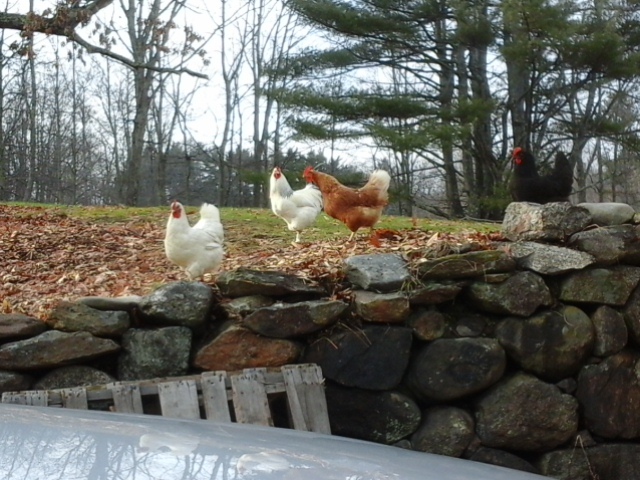 We let them out in the morning to completely free range during the day. Here, they are waiting impatiently for me to let them out. Free ranging has its pros and cons. Pro:they get to enjoy a natural diet and sceatching and pecking everywhere for their food. It also reduces our feed costs. Con: there can be a few territorial disputes. Plus, they are certainly more vulnerable to predators, lkke coyote or hawk. And the occasional vehicle if they wander out on the road. Pro: They enjoy themselves though, and they look healthy. will find little hidey holes to lay.... like this gal hiding under some logs near the wood pile. So its somewhat of an easter egg hunt every day to find them.. I am sure we dont find all of them. 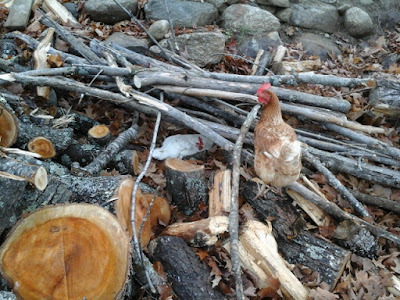 Oftentimes, several hens will use a particularly good spot. 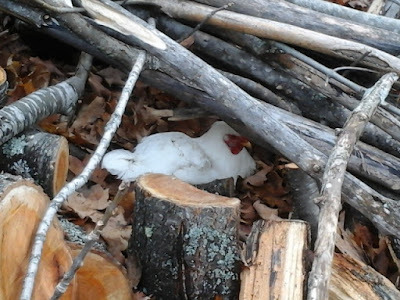 Here one little lady is hoping to get a turn for this nice cozy nest. When I first discovered this spot, there were 15 eggs in there. And finally, free ranging means putting up with those darn geese who think they own the place.